Hello! Hope you had a fantastic weekend! Saturday found me with some friends, swimming in a pool, and drinking ice cream sodas. It was pretty fantastic! Jill at the Vintage Baroness snapped a shot, but I’m afraid I didn’t take a single photo all day. It was quite a nice afternoon! Today I want to post and let you know my favorite vintage sewing and pattern drafting books. Making sewing pattern instructions is a bit of a challenge, I will be the first to admit. When you start sewing vintage, especially from original sewing patterns or reproductions, you might find that instructions are sparse compared to modern standards. Likewise, when sewing new patterns, you may find they pack so much information in that it can make the instructions seem confusing and complicated. The old patterns assumed you know how to sew, the new ones assume you don’t! I think a happy middle ground is the best, and that’s when I pull out my trusty sewing books. A sewing pattern isn’t really meant to teach you how to sew, and it usually won’t fit you right out of the packet. It’s a tool to help you achieve a finished project. Sewing technique and skill are built up through time, and sewing books or sewing lessons are a great way to add to your skill sets. In fact, if you’re not able to take sewing classes and want to learn how to sew you may find that buying an easy sewing pattern and going through a sewing book will help you. They’re meant to be compliments to each other, so don’t think that pulling out a book is somehow a sign of weakness or lack of skill. I pull them out ALL the time- to see different ways techniques are done or if I need to brush up on something I’ve forgotten, or to learn something new! Vintage technique and terminology can be a tad different today than it was in the past. Also, sewing patterns may be a bit different. In 1940s and earlier patterns you often don’t get pieces for facings and underlaps. Instead, you are instructed to finish inside necklines and short sleeves with bias facing, or cut a piece of facing from your scrap fabric. This was meant to conserve fabric and paper- they serve the same purpose as modern facings and pattern pieces for facings, but help to conserve materials. One way is not better than the other- they’re just different. Vintage sewing books can also help you with finishing your garments in a vintage way, or adding vintage style embellishments, since they often come with instructions for detail work like embroidery, tucks, cording, rick rack, and other fun ways to add dimension and interest to your sewing. Anything by Mary Brooks Picken. Seriously, this lady was a wonder. I found that all of my favorite books were written by her. 1) The Singer Sewing Book- Many editions came out of this book. I have a 1940’s edition, but later editions look like they have the same content. *Image above of book for sale on Amazon. 2) Modern Dressmaking Made Easy- also by Mary Brooks Picken, this book includes both sewing technique and how to choose colors and styles, and how to act, walk, and appear to your best advantage. One of my VERY favorites. A lot of the info from this book has been recently featured on Amy Barickman of Indygo Junction’s blog. 3) The Woman’s Institute of Domestic Arts and Sciences books. Also by Mary Brooks Picken, these books range from the 1910s through the 1940s in several editions each. My personal favorites are the books on tailoring and lingerie, since information for those topics are often hard to track down in vintage books. Some are harder to find than others, and some are larger books that are a compilation of smaller books or pamphlets. Some illustrations were changed as the decades progressed, so the illustrations and information in later editions may be different than the earlier editions. 4) Modern Pattern Design by Harriet Pepin. A treasure trove of information. This book can be somewhat hard to track down, but it’s worth it if you can find it for a reasonable price. *Image and book review by/on The Daring Domestic Blog. 5) Dress Design- Draping and Flat Pattern Making by Hillhouse and Mansfield. Another treasure trove of a book- this one is an essential on my bookshelf and I find myself referencing it often when creating or altering patterns. 6- Pattern Drafting & Grading- Women’s and Misses Garment Design by M Rohr. This is an essential for me, and I find myself using this more than any other book on my shelves. In fact, my copy is starting to look quite shabby. 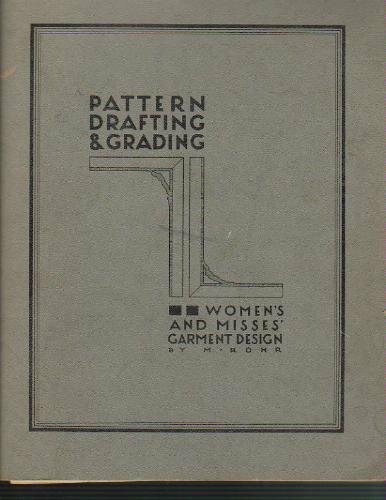 Most of the book is on pattern drafting, though it does have a few pages on basic grading as well, which can be useful to see the two inch grade used for vintage patterns. Great book. Those are my top vintage sewing and drafting books. Do you have any favorites? They all look so good! I do have the Pattern Drafting and Grading and I love it! It is a wonderful resourse. I also have a Women’s Institute set of booklet from 1929. They were my great great aunt’s. Harriet Pepin’s Modern Pattern Design is at my university library. I took it out last year and had a wonderful time browsing through it. I plan on checking it out again and actually using the information in it soon. I’m also going to see if any other of your recommendations are there. Libraries are wonderful things! Brilliant! Thanks for sharing! Oh, and I did love the photo of you with the vintage baroness…looks like you had a fabulous time! I also really like the Reader’s Digest Complete Guide to Sewing, and Vogue Sewing – they’re quite encyclopedic but accessible – and even better, it seems like most public libraries have them! Sigh. I have a nasty suspicion that the demand for, and price, of all these books has just gone up! Thank you for the recommendations! this is an amazing resource thank you so much! I have M. Rohr’s Pattern Drafting and Grading, also. I find that other books are interesting. But, this is the one I return to, again and again. I have both the Pepin book and the Hillhouse/Mansfield book. They are beautiful books, rare but very much worth the price for anyone seriously interested in patternmaking or sewing vintage garments. My very kind pattern professor gave me her personal editions as a graduation gift a few years ago, I couldn’t believe her generosity. I also have a set of the Women’s Institute booklets from the late 20s, as well as a little book called “From Thimble to Gown” that was found in my late great-aunt’s house. A great grading reference book is Jack Handford’s “Professional Pattern Grading for Women’s, Men’s, and Children’s Apparel”, which is also a bit hard to find and expensive. I refer to it ceaselessly. I recommend checking out university bookstores at schools that have a fashion design program, a lot of these books mentioned are used as textbooks and can be found for a good price in the used section with due diligence. Thanks for sharing! It used to be on vintagesewing.info, but apparently it has been down for quite a while. Although I have the hard copy, I feel it is safer to keep a pdf as well. I have added Thimble to Gown to my wishlist at amazon, and hopefully, one day, it will be more affordable or perhaps another free pdf download. Other recommendations are Practical Dress Design – Principles of Fitting and Pattern Making by Mabel D Erwin, and Clothing Construction by Evelyn A Mansfield (a must have) which has illustrations on EVERY (more than 390) pages! And not to forget, if anyone wants to learn how to design all those lovely gowns in the 40s and 50s hollywood style, go to Andrew Loomis’ books (found online free downloads) wonderful resource for sketching your favourite dress design. LOVE THEM ALL!